I used the Wilton bear pan, but switched up the colors to match basic panda colors. I shaped fondant to look like a bamboo shoot with leaves for the panda to hold, and “painted” it with vanilla/dye mix. This, by the way, got pretty runny. I won’t do so in the future. 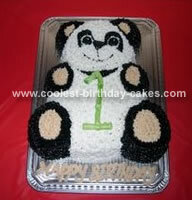 The panda bear cake was a big hit for my son’s first birthday.